It’s that time of the year when business slows down for many of you. Take advantage of this slow time to revisit your marketing plan and make your business more productive and profitable for the rest of the year. Here is our marketing to-do list for July. The mid-year point is the perfect time to evaluate and adjust your marketing plan to make the remainder of the year a success. Take advantage of the down time to experiment with a new social media platform. Related Post: Which Social Media Platforms Are Best For Your Small Business? Make sure all your posts and images are optimized for search engines. It may be HOT HOT HOT now but it’s time to think HO HO HO! If you are a retailer, you already went or are going to the major shows to place your Holiday orders. Non-retailers may be going to industry conferences. You will come back with many great ideas that you can share with your audience. Write a post about what you learned, the trends, tips, etc. Give your followers a sneak peek of things to come. Gather the notes that you made on what needed to be improved and review last year business. Set your goals for 4th quarter. Create a holiday marketing calendar, schedule your special events and plan out your social media updates and emails. Will you need more staff and when? Remember, they need to be trained. When will you roll out the season? If you have a Pinterest business account, remember that pinners are planners, so start your “Autumn / Fall” pin board now to give your followers a sneak peek of your Fall collection or your new products. What does taking a vacation has to do with marketing? Going on vacation can change your perspective and spark new marketing ideas. Plan ahead and schedule your blog posts, emails, tweets, etc., so you won’t have to publish from the beach. Don’t forget to set your out-of-office notification. Give yourself permission to “not be productive” and enjoy your vacation! As a small business owner, there are so many things to deal with daily that sometimes you can’t see the forest for the tree. Take advantage of the slow time to look at the big picture. 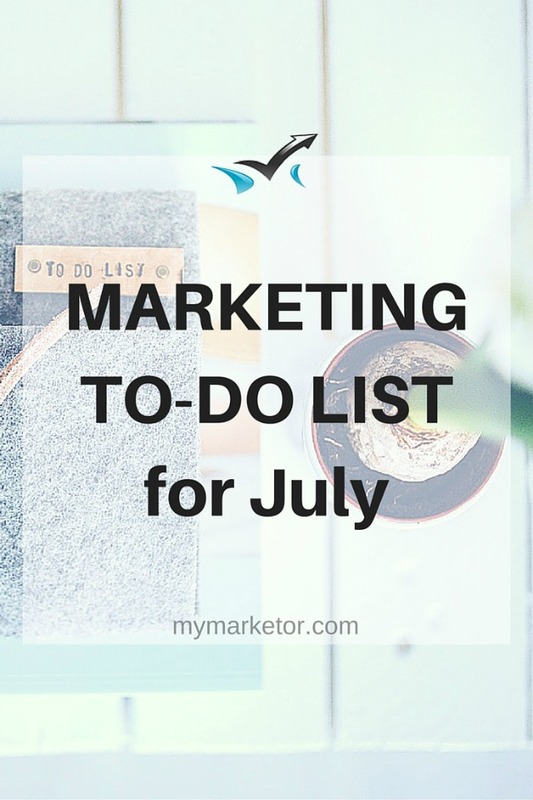 Start with our marketing to-do list for July. Do you need help with marketing? We can help you GET IT DONE! Contact us today for a free consultation.